It was a real surprise to find that we had boxes of full colour slides as well as all the prints. There aren't a huge amount of Birmingham, but what we have is a good selection from around the city, especially in the southern half. 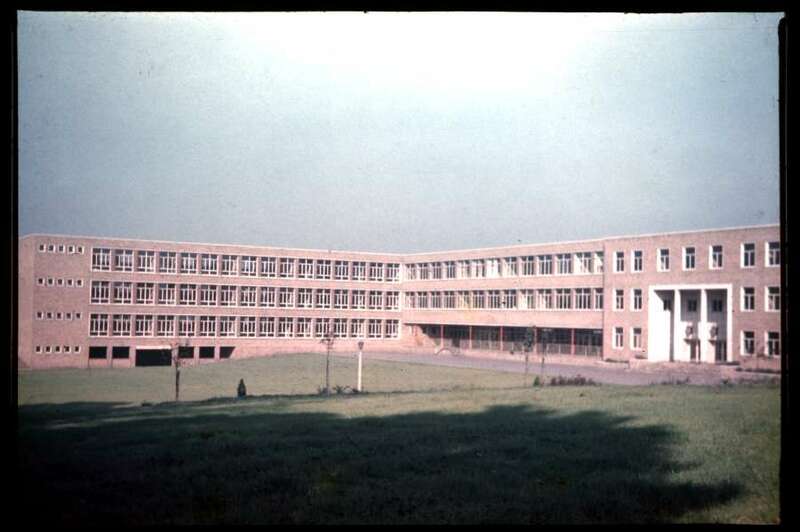 This page features pictures taken in the 1950's. 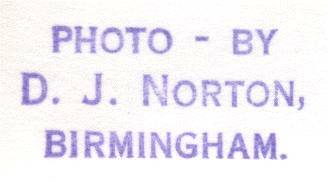 A rare D J Norton photo showing Birmingham before the redevelopment started. This shot is taken from Horsefair. The road to the left is Suffolk Street while the road to the right is John Bright Street. The building on the corner of the two has a sign saying, "Newnes". Thanks to John for letting me know that Newnes were publishers. In fact, Newnes still publish electronics text books today. After some initial confusion about the location for this shot, I've been persuaded (thanks to Mike and Stephen) that it is the junction of Oak Tree Lane with Bristol Road after all. The picture was taken from Oak Tree Lane and is looking towards Bristol Road. 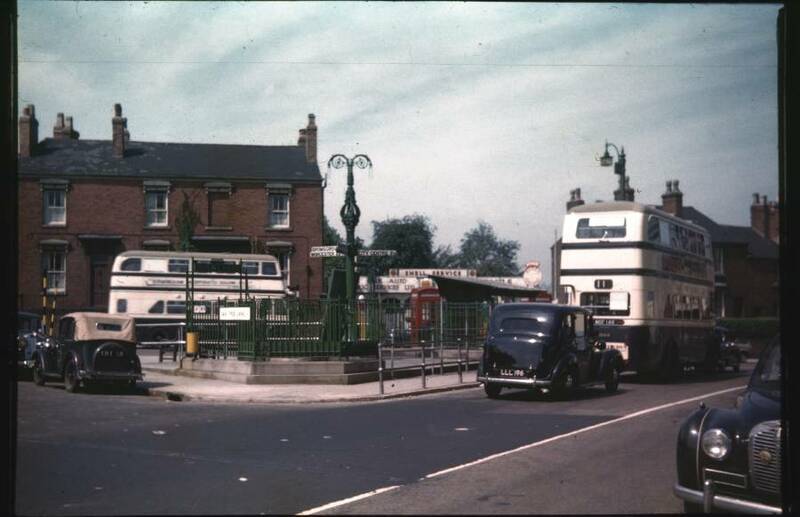 The bus on the left would most likely have been a 61, 62 or 63 heading towards the city centre although David pointed out that it could also have been a 21 about to turn into Harborne Lane. Pamela muddied the waters further by suggesting that the 21 didn't turn into Harborne Lane at the time - that would have been the 20a or 20b! The number 11 is waiting to cross into Harborne Lane. 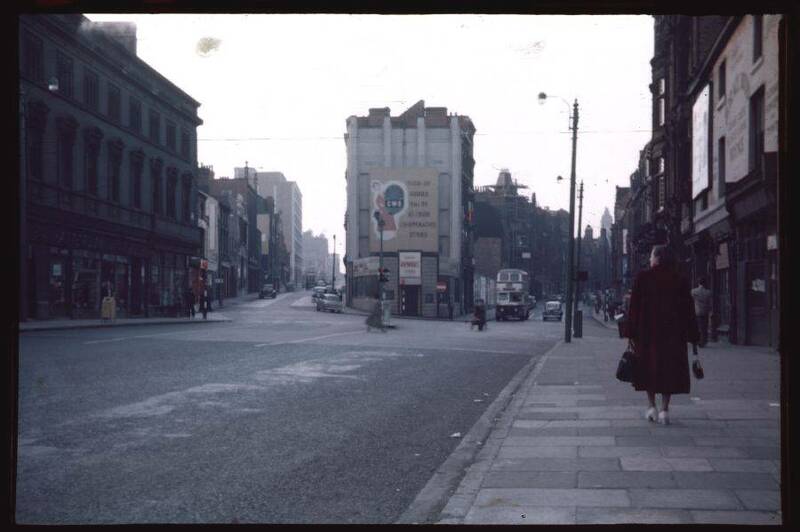 One thing that does confuse me is that the City Centre signpost says 3 1/2 miles in 1955. Today it says 4 miles! Can anyone explain? Here is a view of the scene today. 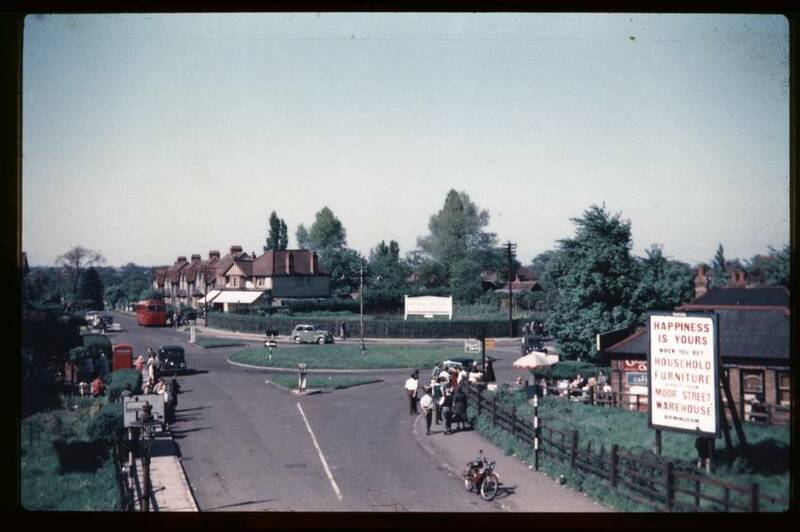 A superb picture of Marston Green taken from the signal box. My father's friend, Vic Goodwin, was the signalman so I'm sure he had no trouble reaching the vantage point for this shot. I wondered why it was so busy, especially at the cafe to the right. I thought it was because it was Late Spring Bank Holiday but that wasn't introduced until 1971. Prior to that, Whit Monday could be any date between 11 May and 14 June as it was 7 weeks after Easter Monday. In 1955, Easter Monday was 11 April so the picture was taken on Whit Monday, 1955! A lovely shot of a tranquil scene in the popular Edgbaston area of the city. 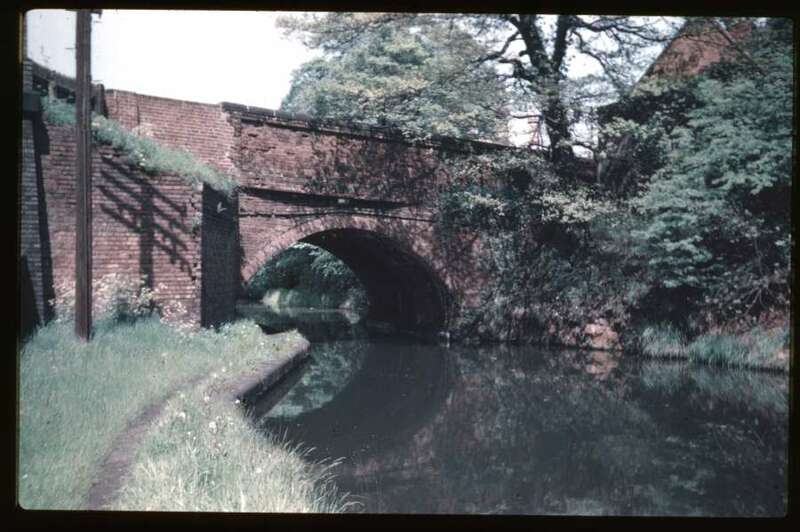 The Worcester and Birmingham Canal heads towards the city centre as it disappears under the bridge. To the far left, blue bricks mark the site of a rail bridge carrying Somerset Road over what was once the Birmingham West Suburban Railway. "The site for this church was acquired in 1861. The committee responsible for the new church obtained plans from the architect Mr. Edward Holmes, following which they entered into a contract with Mr. Charles Jones to build a church to seat 1,000 people at a cost of £2,200. The foundation stone was laid by the Reverend. R. W. Dale in July 1861. The inaugural service took place on Tuesday June 25th 1862 following by lunch in a tent! The total cost came in at £3,700, including two vestries to the rear for ministers and deacons. 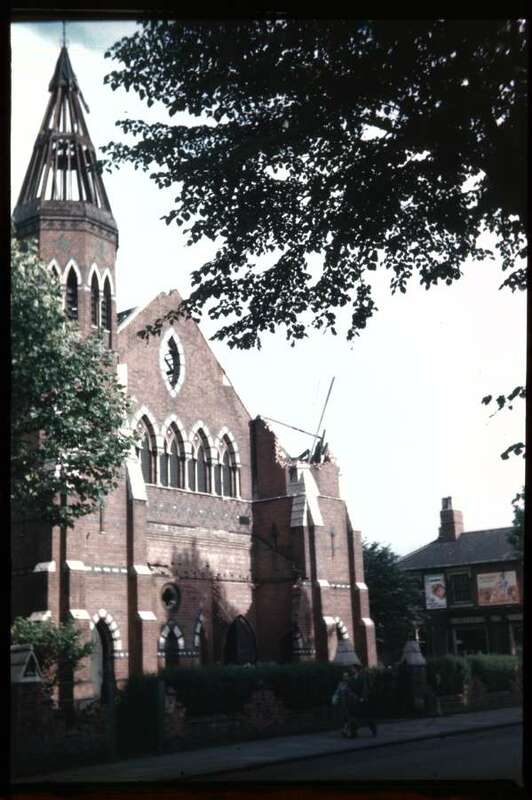 In May 1954 it was announced the Congregational Church was to be sold as it had not been used for services for some time. However, it was stated that the building was in good order. This does not definitely answer your question why the turret was coming down - it was possibly the start of demolition. It is clear from the above info that it was not war damage. Certainly, by the time of a map dated 1965 a metal works occupied the site." 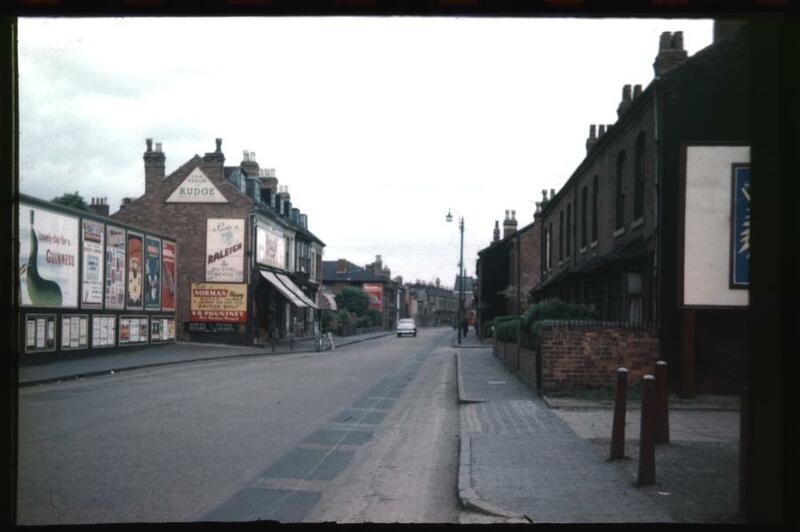 In 1946, the shop visible on the right hand side was an ironmongers called Sandbrook & Co. I can make out that the sign says, "Oils", so perhaps it was still under the same ownership in 1957. Mary Street in Balsall Heath. I had cause to drive down here when taking pictures for the book and I was delighted to see those unusual balconies still in place. The popularity of smoking in the 1950's in made clear by all the signs on the corner shop - Player's, Will's "Gold Flake" and "Three Castles" and Capstan. "There used to be an Egyptian Dr called Dr Dearey, he had a very strange set up, what ever the ailment he always gave you an injection, my father like most of his patients would tip him and he took it. The larger the amount the better consultant you got to see if you needed to be reffered to the hospital for anything. I always remember he had a skull on his desk with a cigarette hanging from his mouth and a plaque which read Poor old Fred died in bed. I kid you not, it was quite a scary thing for a child to look at. I'm sure he died in the 70s and his son took over the surgery. 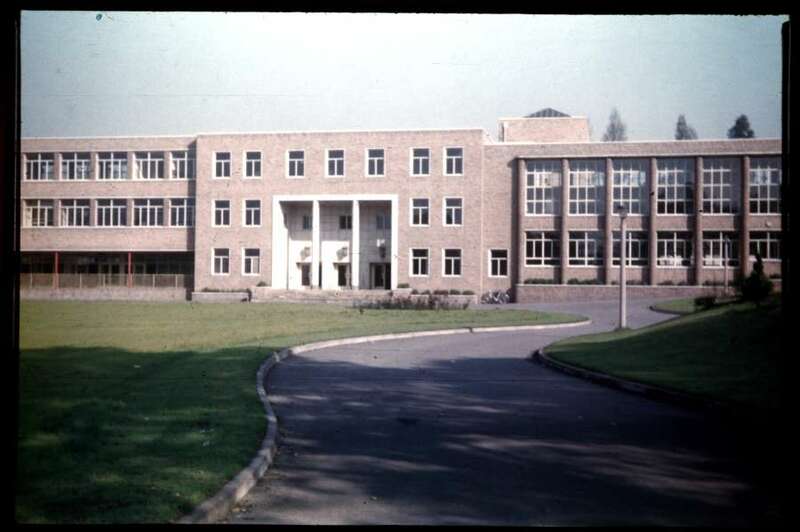 Not sure if he is still running it now though"
Two pictures of what appears to be the then brand new Queensbridge School in Moseley. It must have been a real revelation to pupils and staff used to Victorian schools! It's still in business today - 50 years later. Here is its website. 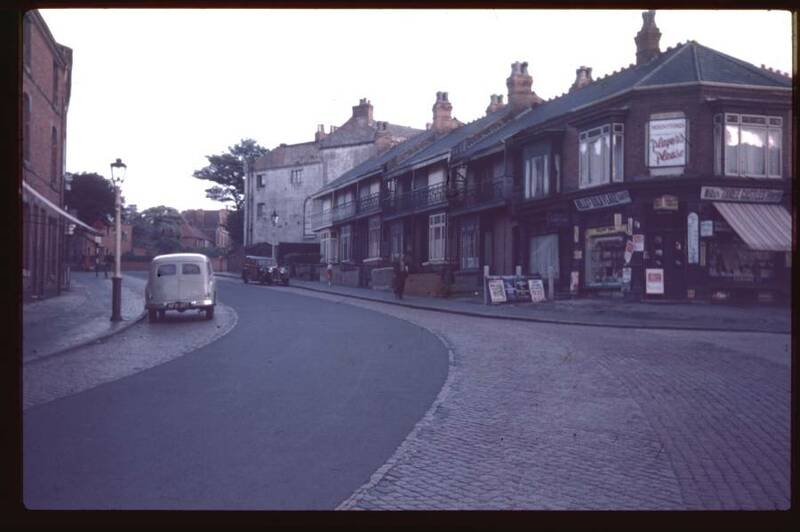 This picture of Moor Green Lane was taken from close to the junction with Russell Road and Reddings Road. The solitary car is located where the road becomes Queensbridge Road. 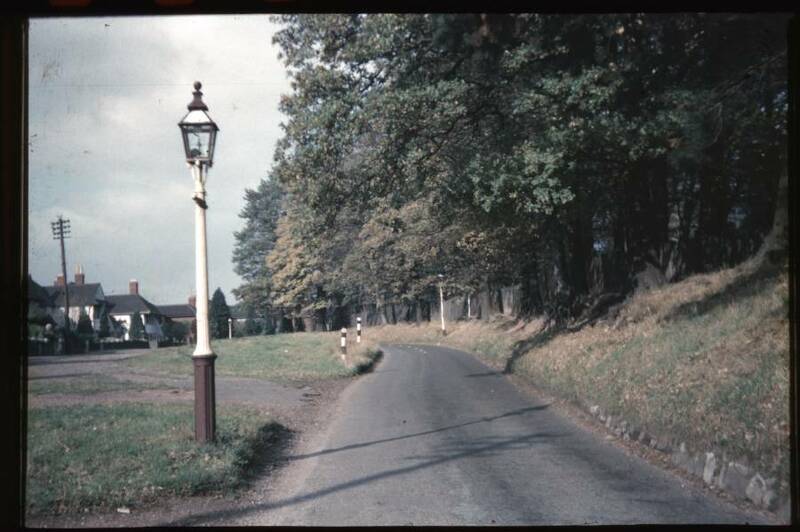 The signpost says, "A435 Alcester Kings Heath". 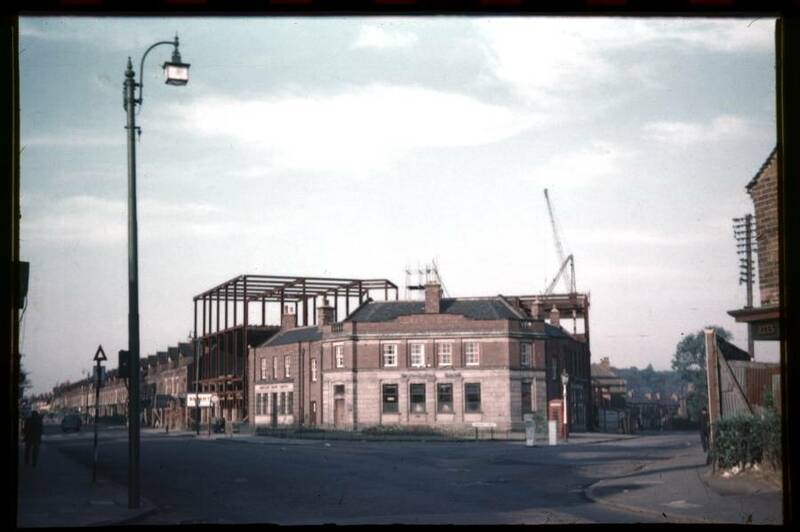 The open land to the right was where Britannic Assurance would relocate to when their splendid city centre premises were demolished during the construction of the inner ring road. Moor Green Lane again, this time close to Shutlock Lane. To the right is Highbury Park, close to Highbury Hall, the one time home of Joseph Chamberlain - an important polical figure in Birmingham's history. This scene is little changed today. Obviously the gas lamp post is no longer there! The other main difference is that the road is now a curious little dual carriageway at this location. 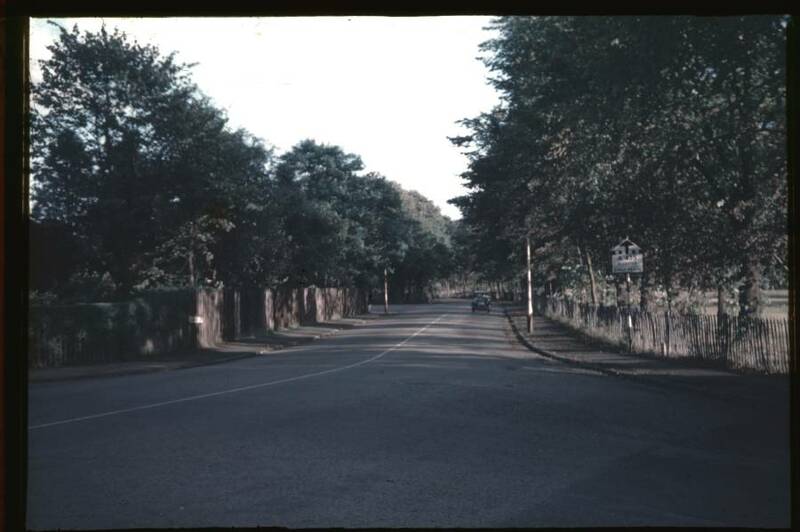 Taken from St. Stephens Road, Pershore Road is off to the left while Dogpool Lane heads off to the right. It's clear that this picture was taken to record the construction of the GPO telephone exchange at Selly Park. Just a stone's throw from the scene above, this shot shows a view from the northern end of Stirchley looking towards Selly Park. The narrow section of Pershore Road cuts through an area known as Ten Acres. This was the home of Cox, Wilcox & Co. Ltd and I was delighted when a housing development in the area retained the frontage of the works building. The yellow and red sign on the bicycle shop says, "Ride a Norman Nippy Moped - British Built". Underneath, S.R.Pountney offers a way to finance the purchase, "Hire Purchase Arranged". The Pavilion referenced in the title of this picture was a cinema and was to the right of where my father was standing. Today it's a gym and bowling alley. 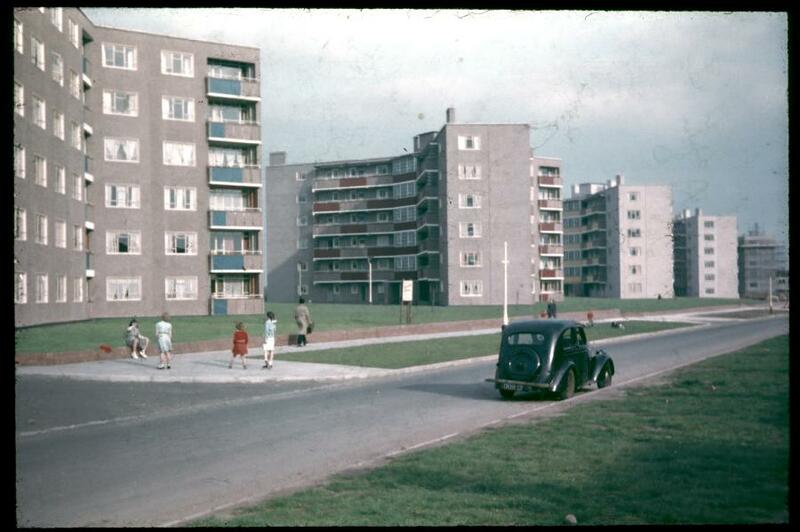 At the time the picture was taken, these flats must have been the height of modernity. The old car in the foreground provides the only indication that this picture is over 50 years old. I didn't know where Holly Bank Road was until I looked it up in the A to Z. I discovered that it was only a small diversion en route to a friends house so I drove down the road and found that the flats were still there. The chimneys on this modern view give away the age of the flats, I think.